Merry Christmas and Happy Holidays! We’re relaxing at home after a whirlwind trip to New York where we visited The Museum of Natural History, a few tourist attractions, and some very good friends. Meanwhile, Todd stayed home with the dogs and bought everything we needed for a holiday feast including an ice cream cake. So with an ice cream cake in the house, I didn’t get around to making dessert. Instead, I spent part of the afternoon making pretzel bread for the very first time. Two years ago, I tried some really good pretzel bread at Payard bakery where they use it for sandwiches. Since then we’ve found it at Whole Foods and have been buying it every Saturday. Still,I wanted to try baking it myself and was happy to see that Fleischmann’s yeast had a recipe for it. The bread is really good and a little softer than others we’ve tried. The recipe doesn’t call for a sprinkling of pretzel salt on top, but I felt like the tops could have used a little, so I sprinkled on a little coarse Kosher (it was all I had) at the end. Changes aside, it was an excellent recipe that should work for everyone. Next time I might try incorporating cheddar cheese and/or jalapenos. Update: It’s been two years since I posted this, but we are still making this pretzel bread. Lately I’ve been making a half batch and shaping it into 1 round loaf. 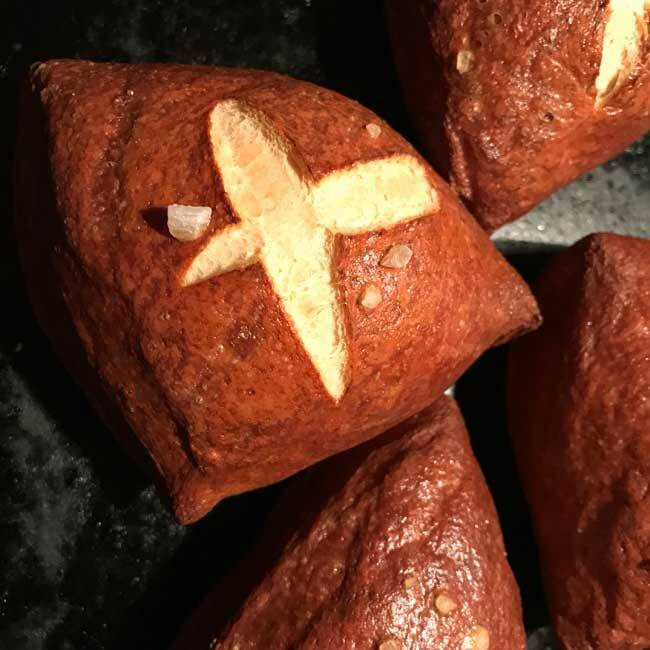 I finally got some actual razors and have been making “x”s in my loaves like the pros do it. 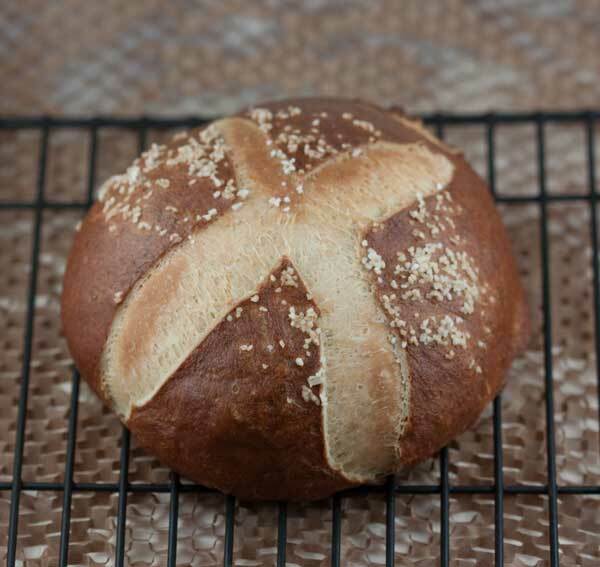 This easy pretzel bread is made with fast rising yeast. If you only need 1 loaf, halve the recipe and use 1 1/8 teaspoon of yeast. Put the milk and butter in a saucepan or in a microwave-safe measuring cup and heat until a deep fry or candy thermometer measures between 110 and 116 degrees. Meanwhile, stir 2 cups of the flour, sugar, yeast and salt together in a stand mixer bowl. Pour the warm milk mixture over the flour mixture and stir until well blended, then gradually stir in remaining flour to make a soft dough. I do this with a heavy duty scraper rather than a paddle attachment so that I can get a feel for the consistency of the dough. Attach dough hook to mixer and let the mixer knead the dough until it is smooth and elastic. Place in a greased bowl, then cover and let rise for 30 minutes to 1 hour (temperature of room might affect time), or until doubled in size. Punch dough down and divide into 2 equal pieces. Shape each piece into a smooth ball and let sit for about 15 minutes while you preheat the oven and get the boiling mixture ready. Preheat oven to 400 degrees F. Line a large baking sheet with nonstick foil or parchment paper. In a large pot, bring water and baking soda to a boil. Boil each loaf for about 2 minutes, turning halfway through. Remove loaves from pot using a slotted spoon or slotted spatula and let water drain off. Dab with a paper towel if necessary. Place on the prepared baking sheet. Brush loaves with egg wash and cut a cross in the top (sharp razor works well for this) of each. Bake at 400 for 15 minutes then reduce the temperature to 350 degrees F and bake an additional 10 to 12 minutes until the loaves are evenly browned. Remove from pan and let cool on a wire rack. The original recipe said to punch down the dough, shape into loaves and then boil. I like to let the shaped loaves sit for about 15 minutes while I prepare the water bath. They'll rise a little while they sit, but they'll also expand quite a bit during the boiling process. I can’t wait to try this. I used to have a german bakery by my house when I lived in Queens who make pretzel rolls. My dad would buy a bag and all 8 of us were happy as clams. I definately recall coarse salt on top. (I work on 3rd ave and when I visit Dylans’ candy shop, I come out of there with the song “I want candy” going around in my head! Thanks for the recipe! 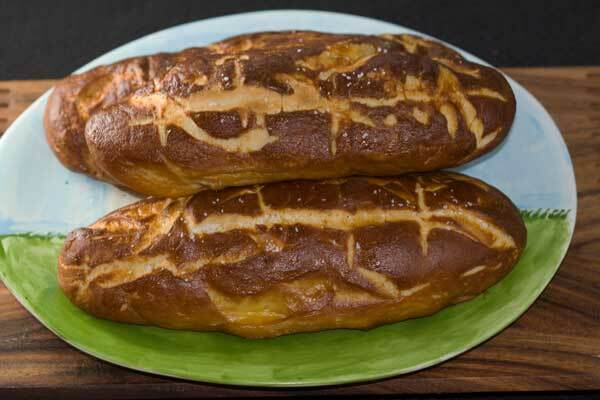 oh…I love pretzel buns, I would eat this whole loaf! We had pretzel bread when we visited NYC and loved it. Thanks for posting the receipe…now that I supposedly have more time, I want to give it a try. I like making bread. I will have to try this one. I had never heard of pretzel bread. Hope you had a great Christmas! This looks great too! I’ve made a lot of bread but never pretzle bread.